Clear skies. Low 46F. Winds W at 5 to 10 mph..
Clear skies. Low 46F. Winds W at 5 to 10 mph. Step back in time at a unique fashion show featuring a collection of museum-quality vintage clothing to be held from 11:30 a.m., Sunday, March 10 at the Napa Elks Lodge, 2840 Soscal Avenue. Have Bag, Will Travel is an entertaining and informative theatrical tour of fashion through the ages. The program features a collection of antique gowns and accessories modeled by volunteers for Goodwill Industries of the Greater East Bay. The show brings spectacular clothing from days gone by to life. Ball gowns, day dresses, wedding gowns, lingerie, wool bathing suits and men’s clothing are set off by vintage accessories including furs, shoes and hats. A notable collection of Worth gowns also will be presented. A three-course luncheon and champagne is included in the ticket price. Tickets are $50 and can be purchased at the Napa Valley Genealogical Society’s library, 1701 Menlo Avenue or by calling the library (707) 252-2252. 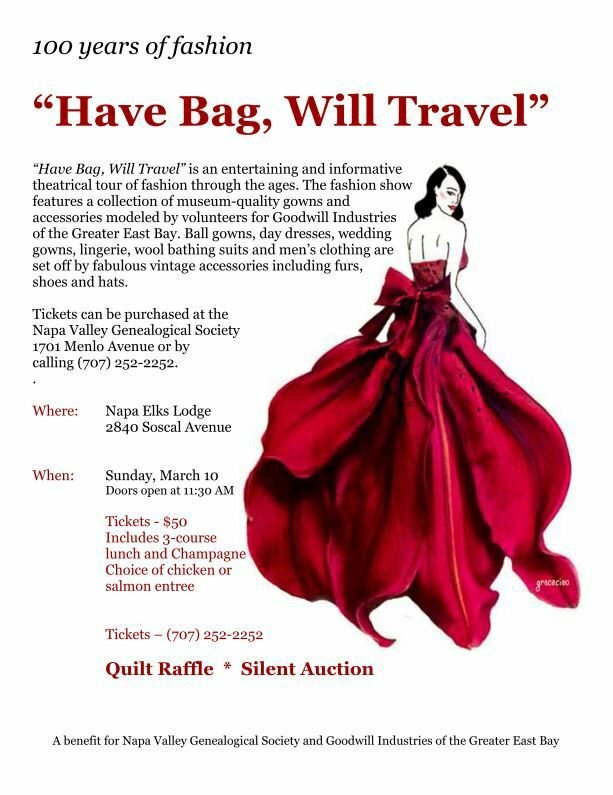 The fashion show benefits the Napa Valley Genealogical Society and Goodwill of the Greater East Bay.